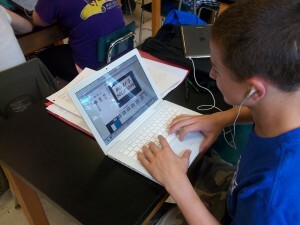 A high school biology student uses GoAnimate to illustrate his working knowledge of a lesson plan. We began using GoAnimate for Schools last school year. It is a wonderful application for students to allow their creativity to come through as they are exhibiting content knowledge. My learning support students benefit the most from the use of GoAnimate for Schools. These are students who lack reading skills and writing skills. If you were to ask any of them to write a story using dialogue they would not be able to successfully complete the task in a well thought out, logical order. However, they are able to create animations, with dialogue, that tell a story and include content information about biological processes. They are very creative when using GoAnimate for Schools. I use GoAnimate for Schools as a project option for most of the big projects in my classroom. Students use GoAnimate for Schools to illustrate what happens in cells as they are placed in different solutions. They also make animations about the process of photosynthesis and food chains. Many of my students choose the GoAnimate for Schools option when completely projects because they begin a story in the first project and tie into the storyline in the next project. They really look forward to using the program. My colleague and I also use GoAnimate for Schools in our lesson presentations. We have recently begun to flip our classrooms and the students receive content information at home for homework. In order for the flipped method to work students must complete their homework. Students are more apt to complete homework if they want to watch the video. The use of animation has made the video presentation of content more enjoyable and entertaining for our students.